Holly Smith grew up in Monkton, Maryland in a food loving family. Holly studied political science at both Colby College and Washington College later attending the Baltimore International Culinary College. Holly completed an externship in Ireland with Master Chef Peter Timmins while at BICC. In 1993 Holly moved to Seattle and accepted a position with Tom Douglas at the Dahlia Lounge. Holly was the sous chef of the Dahlia Lounge for 4 years. In 1999, Chef Tamara Murphy encouraged Holly to become a part of the opening of Brasa. She spent that year as sous chef, leaving to open Cafe Juanita in April of 2000. Cafe Juanita has been a labor of love, allowing Holly to express her passion for Northern Italian food and wine; a commitment to organics and sustainability and a holistic approach to the dining experience. Holly hopes to showcase local products while serving modern Northern Italian inspired cuisine. Chef Holly Smith opened Cafe Juanita in April of 2000, driven by her interest to have creative control in her own restaurant and a strong passion for the foods of Northern Italy. Her hallmark rests with the special care she takes to cook seasonally with the finest local produce and artisan products available from Italy and the Pacific Northwest. The menu at Cafe Juanita changes frequently, but always includes an eclectic mix of meats and seafood, illustrating the commitment to fresh, bold dishes that most often utilize organic products. As a member of the food community, Holly believes in sustainable agriculture, supporting growers whose outstanding quality is tantamount to their long-term commitment to the land. In addition to nurturing the farm industry, Cafe Juanita is committed to offering great wine. The menu is complemented by an award-winning wine list with primary focus on Northern Italian producers and rounded-out with outstanding Northwest wines. From the beginning, Cafe Juanita has received rave reviews, such as Nancy Leson‘s in the Seattle Times in July 2000. Make reservations now. Because once Peter Dow’s old customers get hip to the new Cafe Juanita, and once newcomers get their first taste of Holly Smith’s restaurant revitalization, this Eastsider is going to be booked solid – with both siders. Today, supple leathery banquettes line the L-shaped room’s perimeter, whose oversized windows provide a bucolic view of the new kitchen garden, a gorgeous old apple tree, and lush lawns leading to Juanita Creek. Indoors, the white linen/votive candle/Diana Krall-crooning atmosphere conspires to arouse sensual excitement. That excitement extends to the oft-changing menu, which is informed by seasonality and inspired by Smith’s passion for Northern Italy. Ribbons of fresh tagliatelle tossed with sauteed porcini mushrooms and crowned with shavings of Parmigiano-Reggiano ($10/$19), are an Italian understatement, though I can’t possibly overstate this pasta’s appeal. Even more alluring is the risotto mantacato ($8/$15), hinting of Marsala and caramelized shallots and lavishly laced with a double chicken stock. 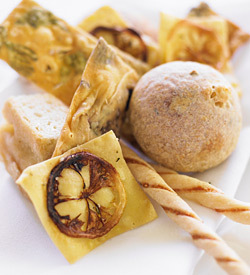 Each of the four pastas offered is available as a first, second or main course. Innovation, artistry, and superior ingredients are key to the kitchen’s success, particularly where the short roster of meat, fish and fowl are concerned. Two elegant, rosy-centered filets of lamb tenderloin are a rustic revelation when sauced with tomatoes, capers, Lucques olives and fresh artichokes. Grouse if you must (we did) at the use of the word “gnocchi” to describe the cake-like square of creamy semolina attending the lamb ($24). We were silenced once this side dish met our mouths. Despite all the praise, we had never made it over the bridge to eat there. Last May, we committed ourselves to doing so by buying dinner for two as an auction item at a fundraiser for Seattle Central Community College’s scholarship fund. Given our interest in and support of SCCC’s Seattle Culinary Academy, this was a natural item to spend our money on. And we had a year to fit in a visit. But that year comes to an end in a month, and our last-minute efforts a couple of months ago to book a table failed. We realized that serious advance planning would be necessary. A month ago, we agreed to have dinner out four weeks later with our friends Brooke and Robin. This was our chance. We checked and, yes, a table was available. Two nights ago, we went. Befitting its origins as a house, Cafe Juanita has limited parking on site. Perhaps eight spots. On our arrival, Gail ran in and learned that they have auxiliary parking rights at a retirement home just down the street. We parked, called B&R, and told them to head there. As we spoke, they drove by, so everything worked out well. Cafe Juanita has a large open kitchen, divided from the seating space by an attractive display of wines. We sat at a table along the wall with the “oversized windows” that Leson described, above the “lush lawns” that sit a floor below. Gail and I took the banquette seats on the window side, giving us a view of the wine storage and, above that, a glimpse of the kitchen. B&R faced us with a view through the windows. As has become our custom when we dine together, we studied the appetizers at length in order to arrive at four that we would collectively enjoy. The pastas come in two sizes, so we couldn’t choose appetizers without each of us first deciding whether we wanted any of the pastas as a main dish or a starter. I always struggle with this decision. A small pasta portion and a meat or fish entree? 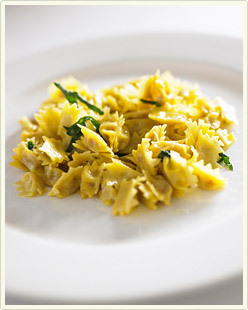 Or a lovely salad of foraged greens followed by a full-sized pasta portion? The waiter, who was outstanding, described the specials, which included a cured salmon antipasto with crème fraîche. Also on the menu is a small selection of specialty cocktails, each paired with a morsel. Prosecco with Parmigiano Reggiano. The Velluto with Castelvetrano Olives. The Negociant with Fried Rabbit Liver. While we struggled with appetizers, Gail ordered the Prosecco and Brooke the Negociant, but with olives in place of rabbit liver. Eventually we each selected an appetizer. Gail went with the Barbera Risotto Mantecato, which presumably is much like what Nancy Leson described in 2000, but with the change in wine from Marsala to Barbera. I chose the Local Watercress with Cherry Vinaigrette, Robin the salmon special, and Brooke the Shaved Beets and Cara Cara with Walnut Oil and Watercress. I’m relying on the menu that is currently available online for these descriptions. Some details may differ from what we had. I do know the beets had Cara Cara, which Gail had to explain is a navel orange. We all tried all four dishes. I don’t know how to choose a favorite. Probably the risotto and the watercress. I’m not a beet lover, usually, but I’ll admit to really liking that too. For a main dish, I chose the full portion of Maltagliati with Jones Family Pork Sugo, Honey Ricotta, and Black Pepper. Here, as elsewhere on the menu, we needed our waiter to explain what words meant. It was obvious enough that maltagliata is a pasta, but I had no idea what type. The essential information is that all their pasta is homemade and “badly cut”. I can’t remember what he said about the shape, but it was a wide noodle. Gail chose the fish special, a striped bass with various accompaniments that I no longer remember, except that one of them was fresh chick peas. Robin chose the lamb dish, which may or may not be exactly what’s now on the online menu: Saddle of Lamb with Confit of Baby Artichokes, Fresh Chickpeas, Taggia Croccantini and Yogurt. And Brooke chose the lone pasta dish that came only in a small size, and that has dropped off the menu, so I can’t find the menu description. The three key words were mortadella, tortellini, and brodo. But was the tortellini stuffed with mortadella? Or was the dish a soup with both tortellini and pieces of mortadella floating around? We asked. The waiter confirmed that the mortadella was inside the pasta, along with other meats, and that the dish was more a pasta than a soup. Oh, speaking of fresh chickpeas, Gail recalled the great ones we had a few years ago at Cyrus during our trip to Healdsburg. I asked our waiter, when we were discussing appetizers, if we could order a small dish of fresh chickpeas for all of us to try. He said sure, and talked about how much work is involved in peeling them. And also, the menu has some side vegetable dishes. We ordered the Roasted Spicy Cauliflower with Cumin, Lime and Pinenuts. We were all thrilled with our entrees, and we all got to taste the others, though we hesitated to taste Brooke’s. Small order that it was, it had a limited amount of tortellini. We would have been happy if they had a larger version, allowing the other three of us to try one or two. (Gail and I were content to cut one in half to split, although that meant all the stuffing fell out.) Robin’s lamb was perfect. If I were to go again with it on the menu, I’d have it. Maybe it’s a menu constant. What Leson described in 2000 sounds like much the same dish. My pasta was great too, but awfully rich. Of course, I couldn’t resist finishing it. However, a little less of that and a little more vegetable might have been a more suitable combination. Speaking of which, the cauliflower was spectacularly good. We required some waiter assistance to sort through the dessert options. The first, Vanilla Bean Panna Cotta with Cardoon Blossom Honey and Vanilla Salt, was clear enough. So was Torta di Mousse al Cioccolato with Olive Oil, Earl Grey Crumb, Bittersweet Chocolate Sorbetto. Piccoli Pasticcini Ginger Biscotti, Hazelnut Baci di Dama, Chocolate Bon Bons, Scorze di Agrumi turned out to be a cookie platter, though in retrospect that seems obvious too. I had the panna cotta, Gail and Robin the mousse, Brooke the cookies. Everyone appeared to be happy. This being the sort of restaurant people dine at for special occasions, we were asked both by the hostess and our waiter if we were celebrating anything. The first time we said no, but then I remembered that Gail and I met 30 years ago this week, so the second time, I told the waiter that. (Looking back at a 1983 calendar now, I’m guessing we met on March 28, which means we were just a day late.) Good thing I told him—in our our honor, he surprised us with four glasses of muscat before dessert came. Which reminds me, I didn’t mention our wine selection. We made a traditional choice, a chianti classico. It was interesting to see that many of the Washington State wineries we’ve been favoring lately made their wine list: Quilceda Creek, Long Shadows, Waters, Buty, Pepper Bridge, Leonetti. We must be doing something right. That pretty well covers it. We left a little after 10:00, not quite 3 1/2 hours after we arrived. It was a great evening.